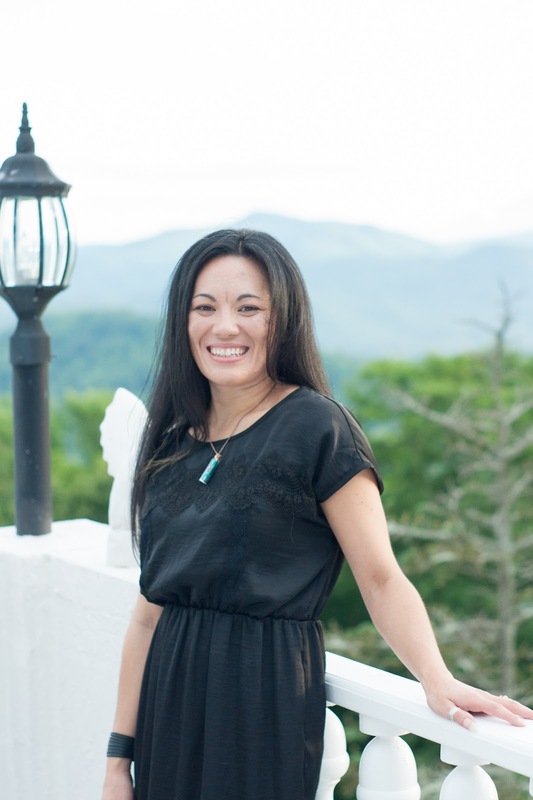 My Entrepreneurial Adventure: Getting Laid Off Was A Good Thing! 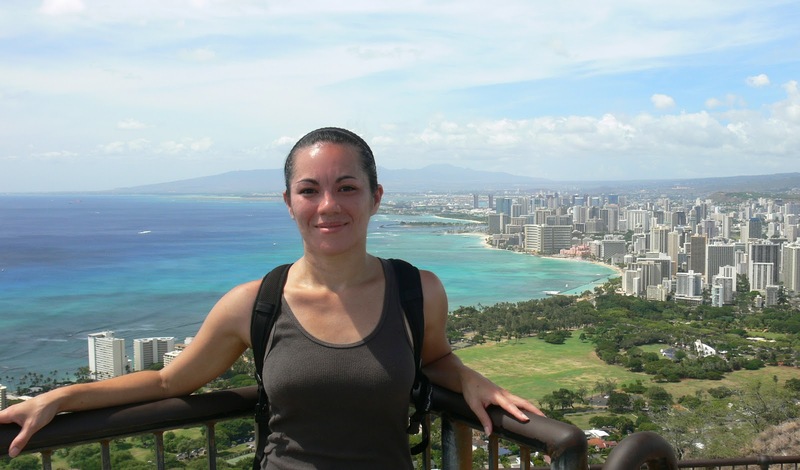 I took a solo-trip to Hawaii for my 29th birthday back in 2009. It was a pretty big deal to me because I hadn't ever done anything like that before—my first plane ride didn't happen until 2007! As I aimlessly drove all over the island of Oahu along Highway 1 in my rented jeep, I experienced a sense of freedom that I had never felt before. Unbeknownst to me, this trip would end up changing my life. During my time on the beautiful island of Hawaii, I discovered that I craved more freedom in my everyday life, not just while I was on a once-in-a-lifetime trip. It was on that trip with my toes in the sand that I made a promise to myself that I would change my life by pursuing what I was most passionate about in this world. Upon my return home, I began making preparations to leave my office job so that I could make my long-held dreams of becoming a full-time photographer a reality. It was difficult for me to think about leaving a job that has supported me for five and a half years, not to mention the comforts of a regular paycheck, but I was determined to do it anyway regardless of the risks involved. In the end, my boss made it easy on me by laying me off without warning just 4 short months after I returned. At that point, the universe made it glaringly obvious as to what I was supposed to do next. Five years later, I am still doing what I love, working for myself as a professional wedding photographer! It is the most rewarding job I've ever had the pleasure of doing, and I am truly honored that couples and families continue to choose me to capture their most epic and everyday adventures. 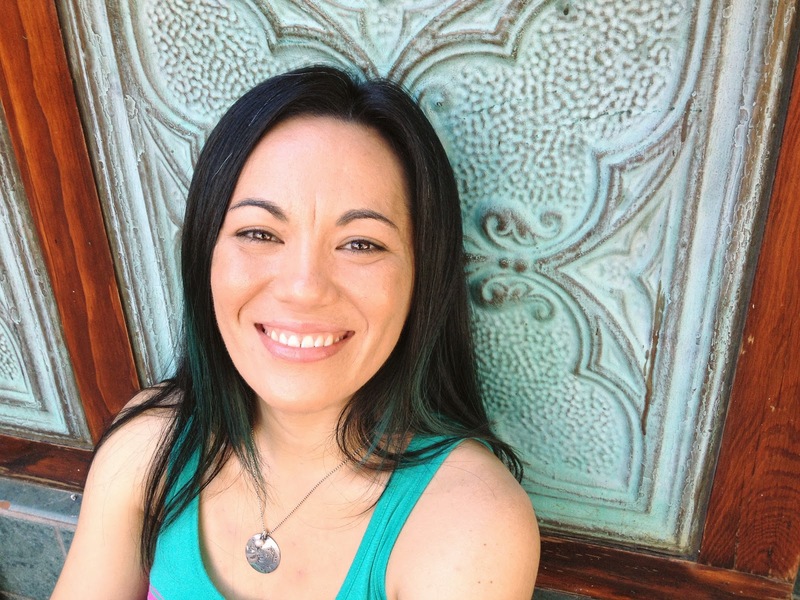 That feeling of freedom I experienced while in Hawaii is something I strive for each and every day, and it is my wish to create an environment where that is also possible for the couples I work with. It is my mission to help you live more adventurously, too! Me at my first wedding of the season in 2014. Can't wait for wedding season to start this year! 5 Years ago I never would have envisioned my life the way it is today. When I made the decision to create my own job after getting laid off back in 2010 I had no clue what I was doing or how I was going to do it. The only thing I really had going for me back then was this unwavering passion I've had for photography since I was 10 years old coupled with an unflinching desire to not go back to an office job that I would end up despising. What I've found out over the last five years is that those two things mean more than ANYTHING when it came to making this dream of mine a reality. A shot of me behind-the-scenes by Raejan Dunn. That only scratches the surface of what I've had to conquer as a new entrepreneur, of course, but those particular areas I pointed out brought the most challenging lessons I've had to endure along the way. None of it has been easy, I’ll tell you that. I made some courageous commitments in 2014 stretching myself in ways that I didn't think were possible, and as a result I was able to achieve some outrageous goals that seemed unattainable at the time. I must say, it was an amazing year that I won’t soon forget because it was one of my best yet! Me at Smithmore Castle during a Wedding Professionals Meeting in 2014. Image by Joy Davis Photography. One of the biggest hurdles that I've continuously had to overcome throughout all of this wasn't something that I really anticipated, but it’s caused me the most frustration and heartache along the way. What’s that you ask? Well, it’s ME! I have been the greatest obstacle standing between failure and success every step along the way. People who are on the edge of taking “THE LEAP” and entertaining the idea of going out on their own have often asked me how I found the courage to “FOLLOW MY DREAMS”. It’s a tough question to be presented with, and one I don’t really have an answer for because we are on different paths. If I wasn't laid off, I'm not sure how long it would have taken me to make the plunge. All I can say is that once you do decide to do it you have to make the decision every. single. day. to continue going after what you want or else it’s NOT going to work. Being your own boss isn't a part-time job or a full-time job for that matter. It’s a lifestyle. Got a story about your entrepreneurial journey that you'd like to share? I’d personally love to hear them below in the comments! How often do you survey people you know for the best plumber or electrician, or the best place to eat when you go out of town? Chances are you've texted a friend or posted a status message on social media asking for help. It just makes sense to get a suggestion from someone you know, right?! No matter what new advertising opportunity presents itself, there’s still nothing better than a good old fashioned word-of-mouth recommendation. It makes the decision making process a little easier for couples in need of a wedding photographer or someone to capture their engagement pictures when they receive a direct reference from someone they know and trust. In all honesty, it's my preferred way for couples looking to hire a Boone, NC wedding photographer to find me. It’s no secret that I like to work with awesome folks, so the best way to do that is to get other awesome folks to refer their family and friends getting married soon. I am so grateful that the couples, families, and individuals that I have had the pleasure of working with in the past have been so supportive and encouraging. They don’t hesitate to tell their family and friends about how much they love their wedding or engagement photos and how they enjoyed their experience working with a free-spirited photographer. Without the help of these incredible people spreading the word about what I do this dream of mine to continue doing what I love wouldn't be possible. WHY SHOULD YOU BECOME A WEDDING AMBASSADOR? Well, it's simple, really. For any couple you send my way that books a full wedding package for 2015 / 2016, I will send you a FREE $100 Visa Card to use for whatever you want! There's no catch. All you have to do is help spread the word! 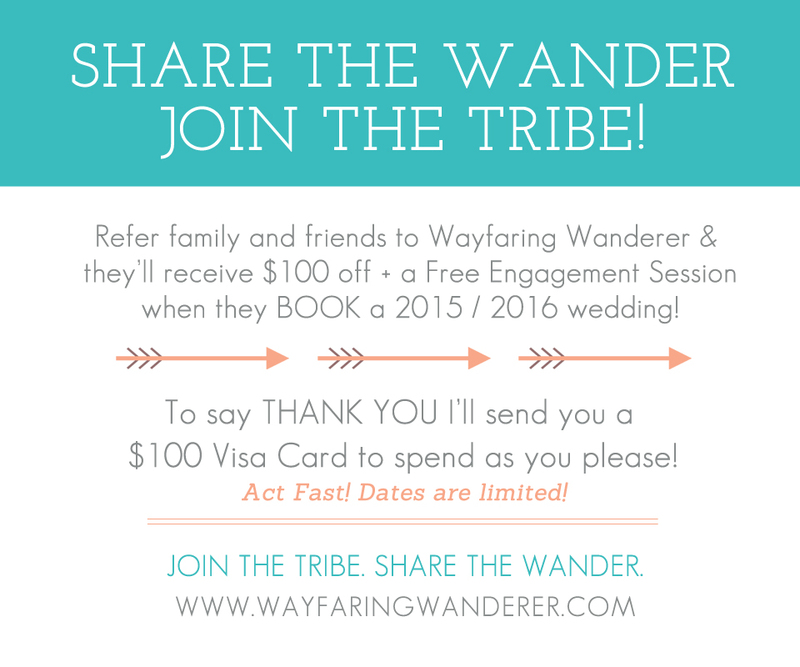 The family or friend that you refer will qualify for $100 off + a FREE Engagement Session when they book their 2015 / 2016 wedding. 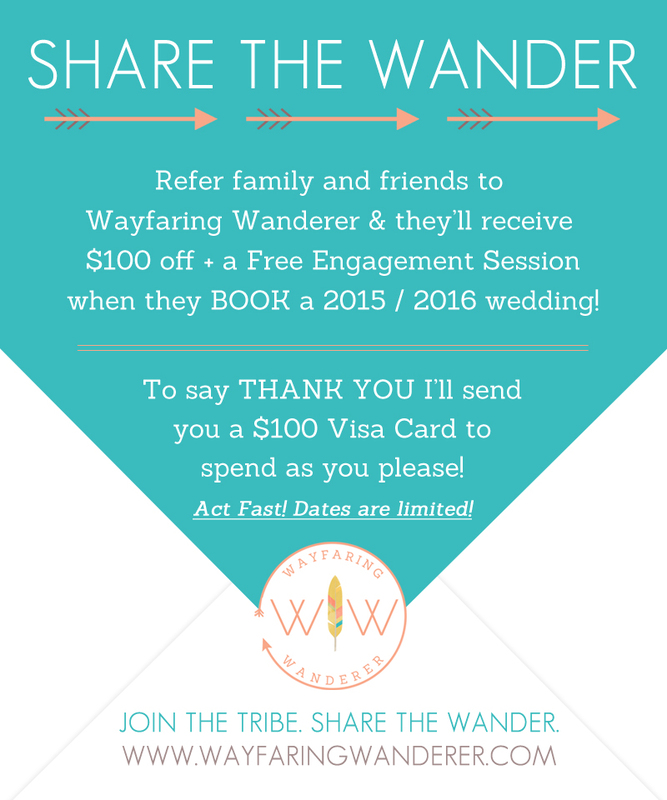 WHO CAN BE A WAYFARING WANDERER AMBASSADOR? This opportunity is for anyone that has family or friends getting married in 2015, 2016, and beyond! I'm looking to reward the folks that help me book the rest of the dates that I have for this year and into next year so this program will be ongoing until spaces are completely filled for 2015 and 2016. You can earn $100 for every couple that books me as their wedding photographer, there is no limit to the amount that you're able to make! You're only limited by the number of dates that I have available for weddings per year. I can't do this without your help! Seriously. Ambassadors are people that genuinely love my photography, have an interest in engaging in what I do, they enjoy being a part of the WW community, they are previous brides and/or grooms that picked me to be their wedding photographer, or couples that attended a wedding I photographed with my fuzzy hubby and thought we were an awesome duo, and/or it can be anyone that thinks Wayfaring Wanderer is just plain awesome! » Be active on the Wayfaring Wanderer blog by commenting and/or sharing new content. » Engage with Wayfaring Wanderer's postings on social media (Facebook & Instagram) via likes, comments, and sharing. » When you hear about a friend getting married, send them a thoughtful message, email, or text to congratulate them and sincerely ask about their wedding planning. 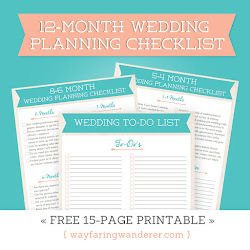 Bonus points if you include any helpful resources you may have used for your wedding planning. I also have some resources available, too! 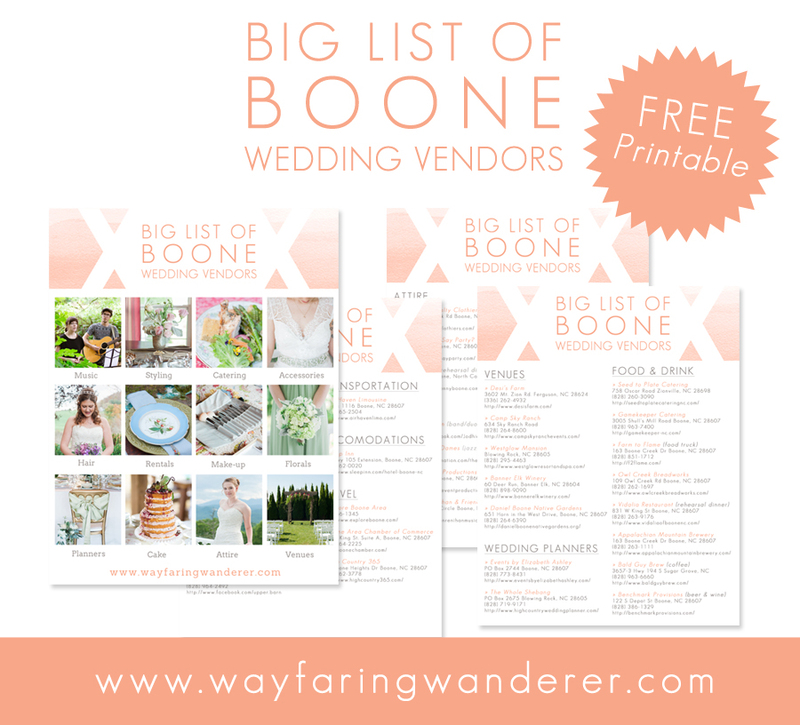 Here’s the BIG LIST OF BOONE WEDDING VENDORS that I have compiled. It’s filled with awesome folks that love to help make your wedding day amazing! 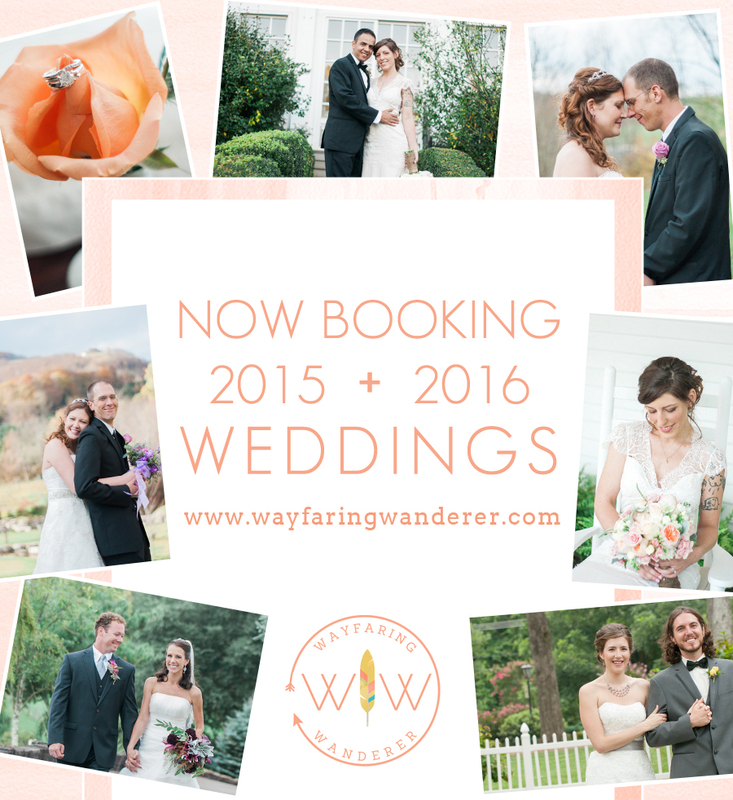 » Share the Wayfaring Wanderer wedding photography website when you've connected with a friend or family member getting married soon. Wedding photographers are typically one of the top five vendors to be reserved in the early stages of the planning process because we book so far in advance, so keep that in mind when reaching out! READY TO JOIN THE TRIBE? If you know any family or friends who may be in need of a free-spirited photographer to capture their most treasured adventures, please help spread the word by sharing this post, link, flyer, or my website with them! Thank you!